Practice is a multi-step learning platform that was developed through multiple National Science Foundation grants aimed at scaling training and skill development. Created by teachers and based on a patented pedagogical design, Practice helps learners develop and hone their skills by using video to engage with the key components of effective face-to-face instruction. Practice is led by CEO, Paul Freedman, Co-Founder, Emily Foote, CFO, Jason Sanders, CTO, Nestor Toro, and CPO, Josh Salcman. Termaxia is led by Changbin Liu (co-founder and CEO) and Boon Thau Loo (co-founder and Chief Scientist). Animotion is affordable mobile technology for joint care. Our data facilitates more accurate diagnoses, individualized motivation for at-home treatment, and monitored assessment of effectiveness to reduce readmissions and improve quality of care. Animotion links to web and mobile software applications for real-time instant access. We translate objective kinematic data into meaningful use. Animotion is led by Laura L. Taddie, CEO. Animotion was co-founded by University of Pennsylvania students Peter Gebhard and Feini (Sylvia) Qu. Byndr connects students, teachers and colleges on a simple, fast and mobile-first learning platform. Byndr was designed and developed with a focus on low-bandwidth and ease-of-use, ensuring every student and teacher, no matter where they live, has access to educational resources inside and outside of the classroom. The LMS for everyone. Byndr is led by our co-founding team of Joseph Freed, CEO; Praveen Vangeepuram, CTO; Marc Garabedian, User Experience; Satish Nampally, Sales & Operations; and Prashanthi Vangeepuram, College Relations. ProNoto is a mobile platform that uses peer sourced content to help busy physicians, researchers, and clinicians stay current. By leveraging one’s trusted professional network, users customize their content experience, learning about new articles while evaluating and recommending articles to others. ProNoto is led by Founder, Brian Jenssen, MD, MSHP; CMO, Tom Alexander; and CFO, Paul Jenssen, CPA, MBA, M.Ed; with support from the Penn Center for Innovation. KickUp provides an easy-to-use platform to help school districts optimize their professional development resources and efforts. We partner with districts to help them understanding and reporting on the impact of professional learning initiatives; provide personalized professional learning that meets the specific needs of teachers; and ensure streamlined communication between every stakeholder involved in professional learning. School districts leverage the platform and KickUp’s consultative services to synthesize data so that all stakeholders – administrators coordinators and coaches, and teachers–can monitor progress, identify meaningful professional learning needs, and demonstrate and share impact. KickUp is led by its founders — CEO Jeremy Rogoff, CCO Victoria Kinzig, and CTO Eric Krupski. TowerView Health helps chronically ill patients better manage complex medication regimens. Cagent Vascular is a medical device company developing minimally invasive technologies to treat cardiovascular disease. Cagent Vascular is led by President and CEO, Carol A. Burns; COO, Peter Johansson; CTO, Robert Giasolli; and CMO, Dr. Peter Schneider. PolyCore Therapeutics LLC is a drug development company spinout from Drexel University focused on development of products for CNS disorders. The initial product in development, PCT-3010, is a biased signaling D3 agonist, a breakthrough once-a-day oral therapy for Parkinson’s disease that improves motor symptoms without development of drug tolerance or dyskinesia. The product will be utilized as monotherapy or as an adjunct to L-dopa to prolong the efficacy time of L-dopa and reduce L-dopa induced dyskinesia. This is a six billion per year market opportunity in the US. PolyCore Therapeutics is led by Jim Harris, Co-founder and CEO; Sandhya Kortagere Ph.D, Co-founder and CSO; and Mike Saporito Ph.D, COO. Ultraflex® patient inspired solutions are the world’s leading dynamic bracing technology for improving joint and limb range of motion, muscle length and flexibility and walking ability. The Company’s breakthrough Ultraflex One technology is the only bracing technology that can control ALL planes of motion and stretch multiple joints in one orthosis (the act of straightening or bending a limb). The Ultraflex ONE™, is a patent pending, revolutionary technology that provides protection, stability, functional assist and LLPS (low load, prolonged-duration stress) in ONE family of advanced orthoses. Ultraflex’s patented adjustable dynamic response (ADR™) elastomer technology for improving walking is also unique to the market, empowering the clinician and patient with individualized gait adjustments for maximum function right on the patient. Ultraflex is led by founder and CEO, Mark DeHarde, B.S., MBA and COO, Brad Shirk, B.S. AlphaPoint is a financial technology company that provides institutions blockchain-enabled solutions to issue, track, and trade digital assets. Its secure, scalable, and customizable platform enables customers to deploy blockchain technology to innovate, differentiate, and transform their businesses. AlphaPoint has 3 live blockchain applications, with over 20 customers, and over $500 Million transacted on the platform. AlphaPoint is led by a seasoned team with 100+ years in financial technology and has offices in New York City, Philadelphia, and San Francisco. AlphaPoint is led by Founder & CEO, Joe Ventura; COO, Igor Telyatnikov; EVP of Technology, Scott Scalf; Co-Founder and VP, Jack Sallen; VP Dev Ops, Keith Dallara; VP of Sales, Scott Bambacigno. WealthHub is a SaaS company that enables the automation for trust management, integrating reporting, CRM, accounting data and administration. Depending on the type and size of customer, the solution provides; 1) measurable productivity gains for trust company clients (e.g. more trust accounts per staff), 2) reduced operating costs, and 3) improved timeliness and accuracy of reporting to meet compliance requirements and to increase customer satisfaction. Jim Marks is President and CEO. He has 30 years of experience as an innovator, analyst and financial technology executive, including seven years helping to start and manage SNL Financial (sold to McGraw Hill for $2.2 billion) ; starting the first Wall Street practice to focus on FinTech as an equity analyst with Credit Suisse First Boston; and co-founding Marks Baughan & Co, a leader among investment banks specializing in financial and legal technology. The Company was founded by Anthony Joffe, President of Sterling Trustees, a trust administration services firm with offices in Conshohocken, PA and Sioux Falls, SD. Commonwealth Computer Recycling is taking the electronics recycling industry by storm with a unique approach to finding value in e-waste. The company offers a full suite of e-waste disposal services to Fortune 1000 clients throughout the U.S., including data destruction, IT asset disposal (ITAD), and universal waste management. Commonwealth’s secure, professional approach ensures all client data is destroyed according to the most rigorous industry standards. Commonwealth is led by Serdar Bankaci, CEO and founder, and Joe Connors, VP Sales, and is supported by local teams in the Pittsburgh and Philadelphia metro areas. 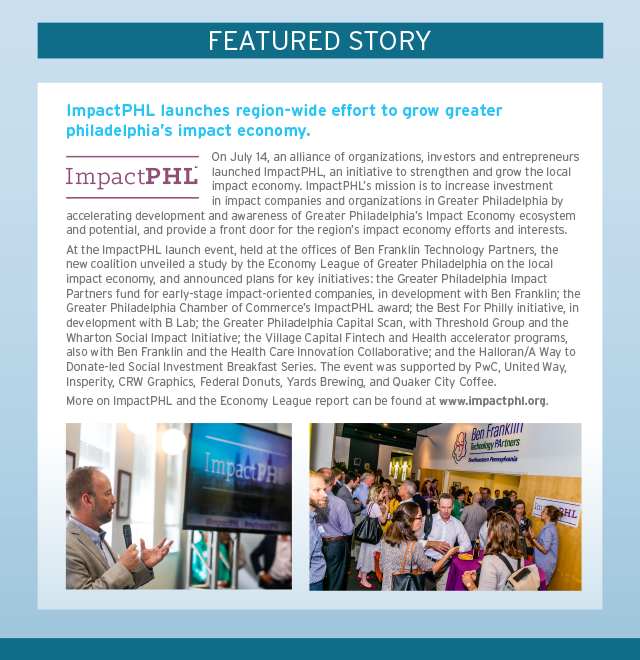 An extensive board of advisors made up of local Philadelphia angel investors and digital marketing experts guide Commonwealth’s long-term strategic planning process.